The halls of Moss Street Partnership School in Reidsville were filled with a flurry of activity last Wednesday, as volunteers from UNC Greensboro and the community helped teachers prepare classrooms for the lab school’s first incoming class on Aug. 27. “Today was truly an exciting day at Moss Street Partnership School, and we are immeasurably grateful for all of the volunteers from our UNCG colleagues and the Moss Street community,” said new principal Catina Chestnut (seen in photo). By 8 a.m., about 25 volunteers had arrived and began unpacking and sorting through everything: a myriad of items including crayons, notebooks and furniture teachers selected from the UNCG Surplus Warehouse. Their goal was to ensure every teacher and support staff will be fully equipped with basic classroom and office supplies on the first day of school, as well as other necessary items like Kleenex. The volunteers hauled furniture to and from classrooms, cleaned and organized storage space, created bulletin boards, and worked hand in hand to clear the school gymnasium of supplies and furniture. MSPS aims to provide adequate school supplies to every student so parents are not burdened with back-to-school-supply shopping, Chestnut said. Volunteers delivered sets of classroom supplies to every teacher in preparation of the first day of school. Earlier this year, it was announced that UNCG would partner with Rockingham County Schools and the Moss Street Community to transform Moss Street Elementary into the new Moss Street Partnership School in an effort to increase student success at the school. Now, student enrollment is at 95 percent. Moss Street Partnership School is part of a larger initiative of North Carolina’s General Assembly to improve student learning in low-performing schools. UNCG is one of nine campuses selected by the state to develop new elementary or middle schools implementing innovative approaches to teaching and learning. Through this partnership, students will benefit from hands-on projects that incorporate science, technology, engineering, visual and performing arts mathematics (STEAM), as well as counseling and nutritional programs to support the students’ health, social development and emotional well-being. Moss Street Partnership School will also serve as an educator-preparation and professional learning site for teachers, administrators, school librarians, school counselors and school social workers. Chestnut was hired in April, and her enthusiasm for her new role is infectious. Construction of the South Chiller Plant is well under way and expected to be completed in between May and June of 2019. Deep foundation work was completed at the end of June, and UNCG Facilities is hard at work installing the foundation system and buried utility systems. Currently, no major traffic disruptions are expected near the construction site (corner of Forest St. and Oakland Ave.). Minor slowdowns may occur over the next six months as heavy machinery is moved into and out of the site. The chiller plant will provide much-needed capacity to the chilled water supply on campus and ensure building temperatures are well-regulated as UNCG expands with new buildings like the Nursing and Instructional Building currently under construction. The new chiller plant will also reduce the need for electrical air-conditioning units, conserving energy and improving overall comfort on campus. Upon completion in 2019, the plant will house one 1,500-ton chiller. The plant is designed, however, to accommodate a total of five chillers to be installed as needed over time. More than 100 artists from throughout the nation submitted proposals. Three are announced as finalists. The Woman’s College Tribute Project Committee wants to know your thoughts on the three. The project had its genesis more than a decade ago. The idea? Commission some sort of project marking the campus’ many decades as an outstanding college for women, as it provided educational opportunity that the women likely would not have otherwise had. Three Woman’s College alumni in particular have guided the effort from its start: Agnes Price ‘62, Molly Arnold Brake ‘62 and Geraldine Newton Fox ‘63. “The Woman’s College Tribute will be a vital testament to an era of excellence in the education of young women,” Price said, adding that is is a foundation of today’s university. Your input is needed, as the committee moves through this process. “We invite you to visit wctribute.uncg.edu and view our three final submissions. Send us your comments about your favorite (or least favorite!) submission directly to the website. Comments will be accepted through midnight on August 10, 2018. A final selection is expected by September 1,” the site notes. The winning project will be installed on the lawn between Stone Building and College Avenue as a permanent tribute to Woman’s College. If you have questions or want more information, contact Dr. Lawrence Jenkens, associate dean in the College of Visual and Performing Arts, at aljenken@uncg.edu or 336-334-3644. Last year, Dr. Kelly Stamp joined the UNC Greensboro School of Nursing as Eloise R. Lewis Excellence Professor and department chair of Family and Community Nursing. In June, Stamp was named the new president of the American Association of Heart Failure Nurses, which is dedicated to the improvement of heart failure patient outcomes through education, clinical practice and research. For Campus Weekly’s Spotlight this week, Stamp tells us a bit about AAHFN and how her work can be of interest to our campus community. What do you plan to bring to the organization as the new president? The American Association of Heart Failure Nurses (AAHFN) is a strong organization with approximately 3,000 members that educate and advocate for heart failure nurses and patients. In addition, AAHFN stays on the cutting edge of creating and implementing evidence-based care for the positive outcomes of heart failure patients. As president, I plan to continue the mission of uniting professionals, patients and caregivers in the support and advancement of heart failure practice, education and research. We will do this through growing our membership and sponsors, improving our marketing initiatives, broadening our patient and nurse focused educational offerings via an online platform and continue to offer the only heart failure certification exam for nurses. In May 2018, we started The Heart Failure Patient Foundation, which will be a 501c3 that will allow donors a tax deduction for their gift. This foundation will provide more resources to heart failure patients as they navigate their disease trajectory. We also have more exciting initiatives around this that will be announced to the public shortly. In addition, we will continue our advocacy efforts for patients to receive the necessary resources so they can take advantage of the latest evidence-based treatment therapies. Last, but not least we will continue to be on the forefront of bringing nurse scientists and heart failure nurse clinicians together to lead the way in nursing research and translation of evidence into practice. We are so excited about our new initiatives and cannot wait to bring updates of our progress throughout the year. What do you appreciate about the organization? I appreciate that AAHFN is the only organization that is dedicated to advancing the knowledge and networking of heart failure nurses and patients. Heart failure nurses are our everyday heroes that are on the frontline in fighting the battle of heart failure with their patients’ day in and day out. As president, I constantly hear stories from patients about how their heart failure nurse helped them through a very scary phase of their heart failure treatment and how they would not have received a particular therapy if not for their heart failure nurse. Our organization stands by these nurses and patients to advocate for the necessary resources to improve patient outcomes. In addition, we not only educate, but certify nurses in their specialty. We did not just create a certification exam to say that certified heart failure nurses performed better, we tested it! A nurse researcher conducted a study with a sample of 605 nurses to test how well certified heart failure and non-certified heart failure nurses performed with providing evidenced based care and decision-making. It was found that certified heart failure nurses performed significantly better with providing evidence-based heart failure care and decision-making than non-certified heart failure nurses. The results were published in the Heart & Lung Journal in early 2018. What opportunities can this bring to UNCG? Every nurse in every specialty will encounter a heart failure patient during their career. My presidency of the AAHFN can bring awareness of the importance of heart failure nursing and the resources that the AAHFN can provide to our community. UNCG supported the American Heart Association’s (AHA) Heart Walk in May 2018 to shed a light on cardiovascular disease and now I hope that UNCG will work with the American Association of Heart Failure Nurses (AAHFN) to shed light on the impact of heart failure, which is the end point of most cardiovascular diseases. With UNCG’s support we can together raise awareness of the impact of heart failure and how we can come together as a community to improve the outcomes of this devastating disease. Approximately 5.7 million Americans have heart failure – it is significant and we can make a difference. I hope that during my Presidency, our nurses, nursing students, providers from affiliated healthcare hospitals and agencies, and other health related specialties across campus will become members of AAHFN to support our mission and vision for the future of heart failure patients, nurses and advanced practice providers. The National Society of Collegiate Scholars (NSCS) chapter at UNCG has been named a Gold Star chapter for the 2017-18 academic year. This marks the chapter’s second consecutive nomination since it was formed in 2011. NSCS is an ACHS-certified, nonprofit honors organization that recognizes high-achieving undergraduates and provides career and graduate school connections, leadership and service opportunities and gives more than a million dollars in scholarships, awards and chapter funding each year. The Gold Star designation is awarded to chapters that exemplify the NSCS’s dedication to scholarship, leadership and service. To be a member, students must attain a 3.4 grade point average and be in the top 20 percent of their class. Additionally, the chapter members engage in service projects like canned food drives and charity walks like the Human Race Walk. The next UNCG NSCS induction ceremony will be Nov. 11 at 2 p.m. in the Elliott University Center Auditorium. To learn more about the honors organization, visit nscs.org. Yahara Touprong kneels to pull weeds from a bed of tomatoes. It’s slow work, he admits, but rewarding. 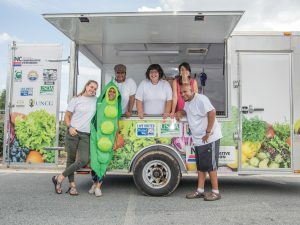 He and Ashley Rose are the two students tasked with the upkeep and harvesting of UNCG’s Community Gardens during the summer. The gardens, located near McIver Deck, are a collection of fifty plots that can be rented by student organizations, staff and faculty to grow edible plants. Together, Touprong and Rose maintain fifteen of these plots, cultivating a wide variety of vegetables and herbs. Food that is harvested from the garden is often donated, but this summer the harvest has been small, so Rose and Touprong take the food they’ve grown home, cook it and share it with friends and family. Touprong, a first generation American, finds the farming and cooking a fruitful way of staying connected to the communal values of his Montagnard family. Not just tasty, the food is a way for Rose and Touprong to engage with those around them. When Touprong’s family sits down to a home-cooked dinner, it brings them closer together. Rose’s inclusion in these meals has strengthened her bond with Touprong, and exposed her to the cultural traditions of his heritage. This sense of community doesn’t stop with the family. On a larger scale, Rose describes how her three years at the gardens have informed her perspective on the wider world. In particular, she has become much more aware of the human element of food production. She recognizes that at some point all food is being gathered and made by real people with real struggles, and through her farming relates to and empathizes with them. Although a newcomer, Touprong’s perspective has been affected by his work at the gardens already. He’s become much more aware of the environment – when a sudden heat wave can destroy your crops, you have to be. Through the careful engagement farming requires, he’s developed a stronger connection with his surroundings and with the natural world. Club co-advisor Dr. Susan Andreatta has seen the way gardening strengthens community many times over the nine years she’s been supervising UNCG Gardens with Guy Sanders. Students keep the experience with them after graduation, too. According to Dr. Andreatta, a number of gardening alumni have gone on to garden in their communities. Some have even purchased farms of their own. Clearly there is a lot to learn from gardening. Both Rose and Touprong value the lessons learned from their time at UNCG Gardens. It’s a distinctly rewarding experience. Where have all the units gone? University Advancement and the Office of Assessment, Accreditation, & Academic Program Planning are now at 821 South Aycock St. The University Teaching and Learning Commons is now at 1100 West Market St., Suite 100F. The UTLC Residential College Offices is in Guilford Residence Hall. The Undergraduate Research, Scholarship, and Creativity Office is currently in Shaw Residence Hall. University Communications and the UNCG Psychology Clinic have switched floors. UC is now on the third floor and the clinic is now on the second floor of 1100 West Market St.
6TECH Service Center is now in the McNutt Building. Healthy UNCG is now in the Kaplan Center. The UNCG Middle College moved to 1510 Walker Avenue, the old student recreation center. The Annual Giving Call Center moved to the basement of North Spencer and the College Foundation of North Carolina moves to the basement of the Faculty Center. Peace and Conflict Studies moved to 1510 Walker Avenue. The Health and Human Sciences Associate Dean’s Office moved to Coleman and Kinesiology Research moved to 1510 Walker. The Kinesiology Physiology Lab is now in Coleman. The Archaeology Lab moved to the former Art Loft space on Gate City Boulevard, at the corner of Tate St., and the Art Loft is in Spartan Village II. The School of Art Lighting Studio moved to the corner of Gate City Blvd and Tate St. The School of Nursing temporarily relocated many research offices to 1605 Spring Garden St. while the new building is underway. The ITS Learning Technologies and Classroom Support moved to Campus Supply. The remaining ITS offices, Institutional Research, Purchasing, and Systems and Procedures moved to the Boys and Girls Club gymnasium building, at 840 Neal St.
UNCG Theatre’s costume shop and storage and a design studio moved to 326 Tate St. Next door, 328, will hold an acting studio and lighting studio. The UNCG Theatre scene shop and paint shop moved to a warehouse at 812 Lilly Ave., near Mendenhall and Spring Garden. HHS Advising and HDF graduate students are now in the Stone Building. Enrollment Management has moved to Forney. The UNCG Online studio moved into a studio at 2900 Oakland. New Mind Education and International Programs’ storage are now in Brown, the SES grant program has moved to the School of Education Building and Fixed Assets has moved to the 2900 Oakland Warehouse. Two UNCG students recently interviewed Chancellor Franklin D. Gilliam Jr, particularly about his perspectives on leadership. See the interview by Eugene Mance Jr. and Keith Parham Jr., the students who are founders of NVsion: Inspiration for Millennials. UNC Greensboro will once again sponsor one of Greensboro’s biggest events – its folk festival. Last year at the National Folk Festival held in Greensboro, UNC Greensboro made a major statement by creating Spartan Way, where our University’s story came shining through. This year, the University will do it again, and make the experience even bigger. But the University needs your help. UNCG Communications is looking for faculty, staff, students and families who want to volunteer. It’s a fun way to spend a few hours over the weekend, be part of the festival, and support our University’s efforts to tell our story and celebrate our city. And get a free commemorative t-shirt as a thank you for your time. The NC Folk Festival will be held Sept. 7-9 at stages throughout downtown Greensboro. Whether you want to help hand out Spartan goodies to festival-goers, set things up in the morning or tear them down in the evening, or find other ways to support UNCG’s efforts at this major civic event, there’s an opportunity for you. Bring yourself, bring your family, and support the North Carolina Folk Festival and UNCG. Faculty and staff: Learn more and register here. UNCG University Libraries can help you with your research and instruction. Librarians can come to your class to teach on research, source evaluations, citations; offer training on Zotero, a free citation management software program; as well as offer scholarly communications assistance, an institutional repository, liaison librarian, data management, and more. Come to this quick 30 minute online orientation to learn more about UNCG library resources and services. If you attend the orientation and fill out a quick evaluation, you will have the chance of winning a $25 Barnes and Noble gift card. New this year was the implementation of a rubric which guided in selection. We had seven applicants for the scholarship. Ricquita T Dillard is currently pursuing her bachelor’s degree in Social Work through the School of Health and Human Sciences and works full-time at UNCG while pursuing her degree. Candace Williams is currently pursuing her degree in Business Administration with a concentration in Human Resources. She also works for Housing and Residence Life at UNCG as a Building and Environmental Technician. Congratulations to these two and thank you to all who applied! Banner 8 INB will be transitioning to Banner 9 pages for Banner HR Time and Leave Entry Users as of September 1, 2018. If you currently use Banner INB PHIETIM and PHATIME forms to key the Departmental Time and Leave Entry for the employee monthly time and leave timesheets, then beginning on September 1, 2018, authorized users (Liaison and Proxy) will begin using Banner 9. Authorized users are required to attend a Banner 9 General Navigation Course before enrolling in the Banner 9 Time and Leave Entry classes. Authorized users are required to attend a Banner 9 Time and Leave Entry training by enrolling in one of the available classes beginning on Friday, August 24, 2018 through Friday, August 31, 2018. The new year is back, and so is one of our favorite traditions – the faculty and staff kickoff luncheon, which will be held Tuesday, August 7, 11 a.m. to 1:30 p.m.
Make time to join the lunch and see some of what is new for UNCG this year. The 2018 Appropriations Act has granted eligible employees a one-time 40 hours (five days) of Special Annual Leave Bonus. Below is abbreviated information surrounding the provisions. The full provisions can be found here. All permanent part-time and full-time EHRA and SHRA employees employed and eligible to earn vacation leave on July 1, 2018 are eligible for the Special Annual Leave Bonus (SALB). Permanent part-time employees (half-time or more) and those who work less than 12 months will receive a pro-rata amount. Temporary employees are not eligible. Similar to last year the Special Annual Leave Balance hours do not expire (except upon separation or retirement) and can be used before comp time but cannot be donated as Voluntary Shared Leave. Upon separation the SALB will not be paid out. These 40 hours are eligible to be used as of July 1, 2018, for any vacation leave taken during the month of July and beyond. There is a special circumstance for employees who end the year (December 31) with an excess of 240 hours of vacation leave. If at the end of the calendar year, you have used any of the SALB AND have an excess of 240 hours, the hours in excess of 240 hours will be reduced by the number of SALB hours that were used. 248 vacation hours as of December 31 with 8 hours of SALB used – you will begin the calendar year with 240 vacation hours,32 hours of SALB and nothing will roll over. 248 vacation hours as of December 31 with 0 hours of SALB used – you will begin the calendar year with 240 vacation hours, 40 hours of SALB and 8 hours will roll into sick time. Timesheets will be updated and available for use not later than August 1, 2018. Please see the Frequently Asked Questions, go to the Human Resources website or call Human Resources at 336-334-5009 with any questions regarding eligibility and use of the SALB. Dr. Dianne Welsh (Bryan School) was inducted into the Fellows of the Pan-Pacific Business Association this summer at the Pan-Pacific Conference in Seoul, Korea. Dr. Jiyoung Hwang also attended the conference and presented a paper. Welsh also has co-written the article “Women Entrepreneurs and Family Firm Heterogeneity: Evidence from an Emerging Economy,” by Dianne H. B. Welsh, Eugene Kaciak, Silvana Trimi, and Emerson Wagner Mainardes. It was published in Group Decision and Negotiation, vol 27 no 3. This summer at UNC Greensboro, 17 first-generation and traditionally underrepresented students conducted research and prepared for graduate school, thanks to the McNair Scholars Program. The Ronald E. McNair Post-Baccalaureate Achievement Program is a U.S. Dept. of Education initiative that prepares first-generation and traditionally underrepresented undergraduate students for doctoral studies. In fall of 2017, UNCG was one of six universities in the state to be selected for the program. The McNair Summer Research Institute kicked off in early May with a weeklong trip to Washington, D.C., to visit the Library of Congress, tour graduate schools and meet with senators. Throughout the intensive eight-week experience, students conducted independent research, prepared for the GRE (Graduate Record Examinations), participated in a writing lab and completed an academic professionalization course to prepare for the graduate school application process. Students received a $4,000 stipend, free housing in UNCG’s Spartan Village and additional funds for meals. Recruitment for the second UNCG-McNair cohort will begin in August, and the fall kick-off will take place Sept. 26. To learn more about the UNCG-McNair Scholars Program, visit studentsuccess.uncg.edu/uncg-mcnair. See full story at UNCG Now site. According to the abstract, this study investigates the feasibility of implementing an assessment engineering design strategy for creating evidence-based medicine cognitive task models and high quality item families for Step 3 of the United Medical Licensing Examination. Dr. Catherine Scott-Little (Human Development and Family Studies) received new funding from the North Carolina Department of Health and Human Services, Division of Child Development and Early Education for the project “Online Leadership in Infant and Toddler Learning (LITL) Post-Baccalaureate Certificate.” Dr. Jean Kang is co-principal investigator on the project. According to the abstract, the Leadership in Infant and Toddler Learning (LITL) post-baccalaureate certificate program will provide funding for instructors and other resources necessary for students to enroll in a new option within the online Birth Through Kindergarten Graduate program. UNC Greensboro’s Bryan School welcomed more than 85 winery and vineyard owners and operators from across the state for its 4th annual NC Wine and Grape Summit July 17. The event was co-sponsored by the NC Wine and Grape Council. The event included presentations on industry engagement, evaluating wine-growing land, marketing, legislation and perceptions of North Carolina wines, as well as open forums for winemakers and vineyard owners to discuss concerns. The summit is part of a long relationship between UNCG and the North Carolina wine. Since 2008, the Bryan School has been providing research and business expertise to the growing industry. Photograph by Victor Ayala, of presenter Dr. John Nowlin (Geography). Dr. Susan Calkins was interviewed by the Wall Street Journal about helping children control their emotions. The article. WUNC Radio featured comments from Vice Chancellor for Enrollment Management Dr. Bryan Terry about UNCG welcoming students from closing for-profit universities. The piece. Chief Human Resources Officer Dr. Victoria Benson spoke to Spectrum News about the impact of social media on jobs. The article. Rising freshman Mariann Juarez was one of four people chosen for La Noticia’s Latin American Excelente award. Read the piece on the awards here. KUNM interviewed Associate Professor Alejandro Rutty about his new album, “Exhaling Space.” The interview. Dr. Jacqueline DeBrew (Nursing) will be honored by the Great 100 Nurses of North Carolina. Honorees are selected based on their outstanding professional abilities and commitment to patients, healthcare, and their communities.. She and the other Great 100 Award recipients for 2018 will be honored at a black-tie Gala at the Benton Convention Center in Winston-Salem, on October 20. CHANCE, a college-immersion experience designed to help make college a reality for first-generation Latino and Hispanic students, will host 120 students, nearly doubling the program’s 2017 attendance. In addition to increasing attendance, CHANCE will also be extending its duration from three days to six and adding more programming and leisure time for attendees. That hands-on experience includes classroom activities, leadership development, course registration, introduction to campus organizations, workshops, panel discussions and more. Some notable classroom activities include an introduction to the School of Nursing’s anatomage table and collaboration in a video editing workshop. Expansions in programming and attendance are in response to the success of the 2017 CHANCE. Every one of the 36 eligible high-school seniors in the 2017 program applied for college, 17 of which were admitted to UNC Greensboro. The program is funded in large part by the Bill and Melinda Gates Foundation as part of the Frontier Set initiative. As one of 31 Frontier Set schools, UNC Greensboro was selected to further a number of initiatives with the aim of identifying successful strategies to improve graduation rates, especially for low-income and first-generation students and students of color. Interested in supporting future CHANCE events? Contact Kattya Castellon at kjcastel@uncg.edu. Photography from last year’s inaugural CHANCE program. Restoring gravestones in an old fishing village on the Outer Banks of North Carolina – it’s not your typical classroom experience. But for 10 students in UNC Greensboro’s IAR 555 (Field Methods in Preservation Technology), the three-week field school was transformative. Duhan was one of six graduate and four undergraduate students who traveled with interior architecture (IARc) professor Jo Leimenstoll to the remote Portsmouth Island – part of the Cape Lookout National Seashore, just south of Ocracoke Island – to work with restoration craftspeople on restoring historic properties. The project was in partnership with the National Park Service, which covered the cost of building materials, supplies and honorariums. The course was first offered in 2001 and continues to build on the partnerships it has cultivated with Old Salem Museums and Gardens and Historic Bethabara Park in Winston-Salem, the North Carolina State Historic Preservation Office in Raleigh and various local preservation groups. While each year reflects changes in the specifics of the field school, the core experience remains one of immersion in the craft of preservation as students engage in hewing logs, splitting shingles, planing moldings, repointing brick, plastering walls, cutting slate, installing wood shingle roofs, consolidating deteriorated wood, reglazing windows, forging iron and analyzing paint finishes. Students spent the first week at Old Salem and Historic Bethabara working with skilled tradesmen to gain a hands-on understanding of traditional technologies for woodworking, blacksmithing, and masonry and plastering techniques. The second and third week built on the first as students moved from traditional technologies to current best practices for restoration work on actual projects in need of stabilization and repair. “After a week in Bethabara Park in Winston-Salem and two weeks in Ocracoke working on Portsmouth Island, I have experienced the spark of passion and overall excitement for my future that originally led me to the interior architecture program at UNCG two years ago,” said IARc BFA student Melissa Sokol. Past projects include the restoration of the Barker House, a modest 1770s farmhouse in rural Vance County in 2014; the historic Ward-Hancock House, in Beaufort in 2015; and the Pauli Murray House in Durham in 2016. Immersive experience with historic buildings is an essential part of preparing IARc students interested in the fields of historic preservation and community revitalization, Leimenstoll believes. UNC Greensboro’s School of Nursing graduates take giant steps ‒ from the impact of daily patient care and outreach to becoming leaders in the nation’s top nursing organizations. One of those is Dr. Ernest J. Grant ’93 MSN, ’15 PhD. Grant grew up in a small town in the mountains of North Carolina, as the youngest son of seven children. After high school, he enrolled in Asheville-Buncombe Technical Community College for the Licensed Practical Nursing program, and the rest is history. Big history. Grant received his master’s degree in nursing from UNCG in 1993 and later returned to earn his doctorate. In 2015, he became the first African American male to graduate from the university with a doctorate degree in nursing. This summer, he was elected president of the American Nurses Association (ANA), the premier organization of the nation’s four million registered nurses. He is the first male to hold the position at a time when, on average, fewer than ten percent of practicing nurses are male. Grant, who was previously ANA vice president, is an internationally recognized burn care and fire safety expert. He oversees the nationally acclaimed North Carolina Jaycee Burn Center at the University of North Carolina (UNC) Hospitals in Chapel Hill, where he has coordinated prevention outreach programs for more than 35 years. After Sept. 11, 2001, he volunteered at the Burn Center at New York-Presbyterian Hospital / Weill Cornell Medical Center, and cared for patients injured during the attacks on the World Trade Center. For his service he received the Nurse of the Year Award from then president George W. Bush. Grant has also served as a consultant to the government in South Africa preparing fire safety curricula and advising the Congress on burn prevention law and policies. 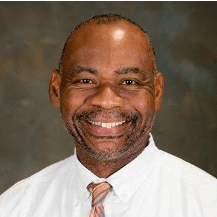 Grant teaches as an adjunct faculty member for the UNC-Chapel Hill School of Nursing, where he works with undergraduate and graduate nursing students in the classroom and clinical settings. He also gives back to UNCG, remaining active on the School of Nursing Advisory Board. The year that he earned his doctorate, Grant established the Ernest J. Grant Endowed Scholarship in Nursing to provide support for multicultural male students with financial need seeking degrees in nursing. He has been named UNC Greensboro Alumnus of the Year and in 2010 became the first African American male president of the North Carolina Nurses Association. Charlie Maimone, vice chancellor for Business Affairs since 20​14, recently sat down for a Campus Weekly interview about the upcoming expo and conference that Business Affairs will offer the campus on Aug. 1. We asked about a few other things as well. CW: What are some things about Business Affairs that maybe people don’t know? Maimone: I​’m guessing most faculty and staff could not list all the departments in Business Affairs. In some ways that is absolutely OK because our departments are university services with their own identities. So many of our departments develop working relationships with practically every department on campus so it’s easy to think of them as stand alone programs. For example the Print shop, Purchasing, Campus Police or Human Resources all communicate their services directly to our campus. Actually, the ​upcoming ​ expo​ is really ​a great place to see the wide range of programs within Business Affairs. At the same time, I’m sure most people might not realize how much the business affairs departments depend on each other to complete all of the required work of the university. CW: Can you give one or two examples? Sure. ​When you think of ​our ​Facilities​ department​ there are actually 6 major areas of responsibility with over 20 departments. For example our Facilities Operations area is made up of 7 departments – Building and Trades, Work Order Services, Energy Management, Facility Services, Grounds and Garage, Surplus Warehouse, Services, Utility Operations and Waste Reduction and Recycling. Our Campus Enterprise area is made up of 8 departments – Bookstore, Dining – everybody’s favorite, Parking, Printing, Property Leasing, Spartan ID Card, Spartan Mail and Vending. With any major event on campus nearly all of these departments will be involved. Helping to get ready for the event, helping out during the event and finally helping put the university back to normal after the event. CW: Some of this is what people will learn at the expo and conference? Absolutely. On August 1st, the third ​annual Business Affairs Expo will take place in the EUC and the second ​annual Business Affairs conference​ and workshop for the campus will be going on too​. ​This day is a great way for our teams to present their services to the campus, to answer questions and to interact with others to describe how we can help. We’ll have about fifty people set up during the expo, and many different departments will present what they believe to be the most important services that they provide to the campus community. They will be able to interact with individuals and small groups, answer questions about the services and just enjoy getting to know each better. The expo is a very casual event. You can decide how long to stay, which departments you want to talk to – a no pressure environment. What we try to do is to identify compelling, important, relevant topics that individuals across the campus can use in the coming year, and really update them on what, let’s say, slight changes may have occurred to travel or reimbursements or something in Purchasing. By the way, it’s free, with refreshments! CW: Are there two or three examples of some new things they may hear about? ​P​ivot tables​ are a great tool in Excel that allows you to summarize a great deal of information and present it on a single page. ​We use them a great deal ​ in budget planning and budget management ​ but they can be used to help organize lots of information. ​ ​Another good example, is our University Police Department ​will be conducting the very important. Run Hide Fight ​training. It’s a program that helps departments​ and individuals recognize what they ​can and ​should do in​ the event of an active shooter on campus. ​The program has been taught about forty different times​ year​ and the feedback is excellent. Our police department would love to reach ​ every ​ individual across the campus, so the Run Hide Fight as a conference workshop​ will be a great opportunity​to take the training if you have done so already. Last year we had over three hundred people come to the expo ​and ​one​ hundred and twenty-five people attended the conference​. We hope everyone who attended last year will return and even more folks will come​ for the first time. CW: Anything else you’d want to mention about the service your division provides? Within the Business Affairs division, ​many of our departments have ​ the very important responsibility ​of​ ​regulatory ​ compliance and ​public accountability that goes along with ​being an agency of the State. Keeping the university in good standing with local, state and federal regulations while trying to meet the service needs of 3,000 employees and 20,000 students can be challenging. We not only accept the challenge but embrace it. What makes programs like the Expo and the conference so important to us is the amazing opportunity we have to hear directly from our colleagues and to better understand exactly how we can help them to accomplish their part of our university mission. The better we understand your programs, the better we can line up our services to help. CW: Anything else people will probably want to know about? Anything on the horizon? ​The first thing that comes to mind is the important investment that Business Affairs partnering with Information Technology and Academic Affairs ​is making in the Banner 9 Initiative. ​This collaboration is transformational and the staff’s dedication to improving UNCG’s use of technology is amazing. We are aligning our ​use of technology around​ a single commitment to improving student success. One wouldn’t necessarily​ immediately think about the impact that ​business affairs might have on student success, but ​when we line up our systems and ​focus our business ​processes and procedures ​on student​’s progress toward degree, it’s remarkable how quickly we can make the connection between what we do every day and student progress. One early example is the great work our ​Cashier Office​ has done partnering with the Financial Aid Office and Registrar’s Office to develop new payment plans. ​As mentioned before, there are tremendous compliance responsibilities​ and certainly high ​regulatory constraints, but ​the teams have used the technology to build new payment plans and lessen the pressure of payment deadlines for many of our students. Interviewed by Mike Harris. Interview was edited and condensed. All employees are invited to the UNCG Expo and Conference presented by Business Affairs, on August 1 in the EUC. Learn more and “put a name to a face.” See information here, including how to register for the conference. Patricia M. Lynch, director of EEO and affirmative action, and Veronica L. Sills, EEO consultant and investigator, both of UNCG Human Resources, received their Equal Employment Opportunity and Diversity Fundamentals (EEODF) Adjunct Trainer Certification in June. This course was previously referred to as the Equal Employment Opportunity Institute (EEOI), which is a state-mandated diversity initiative. EEODF is required for all state government employees who were hired, promoted or appointed to the position of manager or supervisor on or after July 1, 1991. The newly revised EEODF course is designed with the latest information needed to help managers and supervisors understand federal and state equal employment opportunity/affirmative action laws in the context of daily work situations. The course also provides managers and supervisors with applicable information to help them work more effectively with a diverse workforce. Designed with a blended learning format, the EEODF course includes two components: online training with a final assessment and one full day of instructor-led classroom training. Their training lasted over six months with intense learning objectives, required homework and many hours of studying to become certified. As certified trainers, Lynch and Sills will be able to instruct UNCG managers and supervisors in the instructor-led classroom training. Sessions at UNCG will begin in fall 2018. Managers and supervisors who have received their EEODF training in past years are welcomed to retake the training; however initial classes will be offered to managers and supervisors who have not completed the training. To begin the first component of the EEODF course, register online with UNCG Human Resources Training Catalogue at this address for the Prerequisite Online part of the training: ONLINE . For the required Classroom training, you can register here: CLASSROOM. Both parts are necessary for completion of the training, and the Online part must be passed before being admitted to the Classroom section. Staff Senate will sponsor two volunteer opportunities next week. 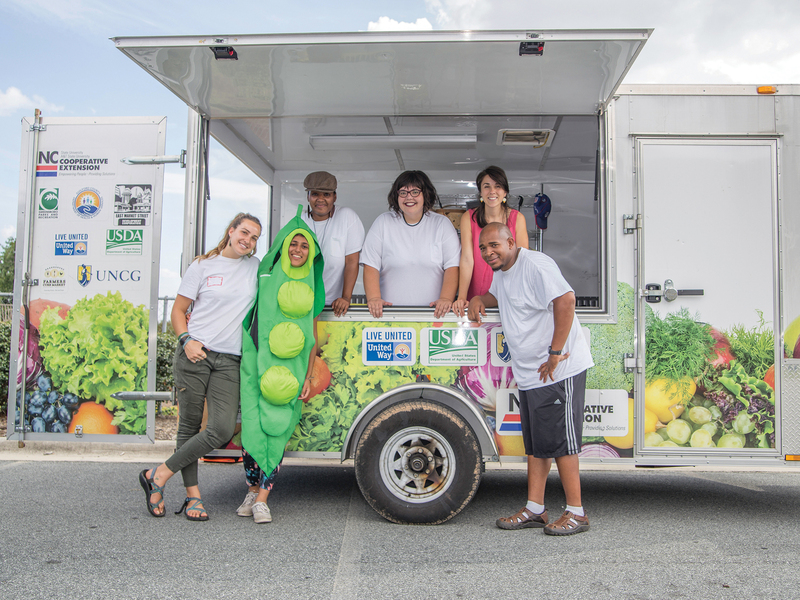 Tuesday, July 17, from 2:30 to 4 p.m., all UNCG staff are invited to engage with the community through the Out of the Garden Project’s Fresh Mobile Market food drop at the Mustard Seed Health Clinic at 238 S. English Street. The Fresh Mobile Market (in visual) will distribute 50-17 pounds of food per family. Closed toe shoes are a requirement for this volunteer opportunity. Heavy lifting is involved but can be avoided for those who are not able. Sign up here. For more information, contact Britt Flanagan at 336.334.4686 or bsflanag@uncg.edu. Thursday, July 19, there is an opportunity to volunteer at the Moss Street Partnership School. Volunteers will participate in cleaning, moving things, setting up classrooms, creating bulletin boards, and any other tasks to help the school get up and running. For information, contact Amber Wall at 336.334.3102 or aswall@uncg.edu. See full story at UNCG University Advancement site. The Weatherspoon Art Museum will host two more Tours & Treats events this summer, on Thursday, July 12, and Thursday, Aug. 9. Each evening is an opportunity for visitors of all ages to view the galleries and tour an exhibition with a guide before participating in hands-on activities and receiving a cool summer treat. This Thursday’s event includes hands-on activities related to nanoscience and the “Extreme Measures” exhibition, with special visitors from the Greensboro Science Center. For the August Tours & Treats event, UNCG’s Michel Family Teaching Resources Center will visit with their new Icicle Tricycle, a vehicle for taking books and stories on the road. Events are free, and no reservations necessary. If your group is larger than 10, please let the museum know by calling 336 334-5770 or emailing weatherspoon@uncg.edu. Dr. Meredith Powers (Social Work) received new funding from The Junior League of Greensboro, North Carolina, Incorporated, for the project “Parks for All People: Promoting Health and Wellness by Engaging Aging Populations in Public Parks.” D. Justin T. Harmon and Dr. Benjamin D. Hickerson are co-principal investigators on the project. According to the abstract this project will focus on the health and quality of life needs of older adults in Greensboro through the rehabilitation of neighborhood parks to better serve their recreational and leisure preferences in public spaces. This project will benefit from the Junior League of Greensboro grant by building on an existing community partnership between the Department of Community and Therapeutic Recreation and the City of Greensboro’s Parks and Recreation Department. The abstract states that there are more than 100 neighborhood parks in Greensboro, with few of them adequately serving the specific needs of an aging population. The project’s partnerships for park enhancements are crucial in order to increase accessibility (e.g., wheelchair paths, benches) and participation of older adults in these public spaces.